With the weather getting nicer, my days of soups and comfort foods are behind me until next season. I have been starting to crave summer vegetables – peppers, broccoli, tomatoes, kale, and the like. Thus I suggested to Steve we make a veggie stir-fry. If Steve had it his way, we would have made a repeat Mac N Cheese or lasagna. But those foods remind me of cold weather, something I am trying to put behind me. So a rainbow of veggies it was. The best rainbow I’ve made yet. Seriously, I have made a lot of stir-frys in the past. It was my go-to meal in college. But this was stir-fry perfection ladies and gents. I looked at a few vegetable stir fry recipes online for inspiration and then made my own creation. Cook brown rice as directed on the package. For quick and easy brown rice, I popped a bag of Trader Joe’s frozen brown rice in the microwave and 3 minutes later, it’s ready! Drain the tofu and press it while you are prepping all the vegetables. Rinse and chop all vegetables. Cut tofu into 1 inch blocks. In a small fry pan, add 1 tbsp canola oil and heat tofu over medium-high heat. Once lightly browned, flip tofu to cook on opposite side. After a few minutes (once golden brown), remove tofu from heat and set aside. In a wok (or a large saute pan like we used), add canola oil and let heat over high heat. Add the onion, peppers, carrots, and broccoli. Stir frequently. Once vegetables are starting to tender, add the mushrooms, garlic, and Soyaki sauce. Continue to stir frequently. Add tofu and sesame oil. Add black pepper to taste. Add additional Soyaki sauce to taste as needed. Plate a serving of brown rice and top it with the stir-fry. Bon Appetit! I was so happy with this tofu + vegetable stir-fry. I loved the taste, the colors, and the reminder that Spring is here to stay! Do you have a meal that took you many many attempts to finally perfect? 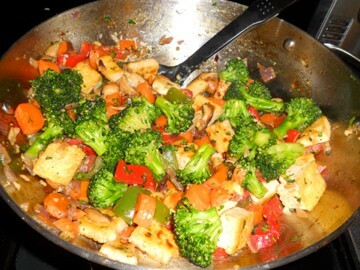 What about a stir-fry recipe you enjoy? 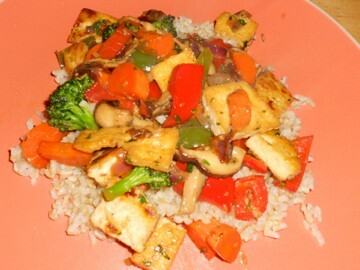 I have wanted to try tofu, and this seems like a great “tofu introduction” meal – looks delicious! !